Comment: Crisp and clean. Perfect spring sky blue. Full size. 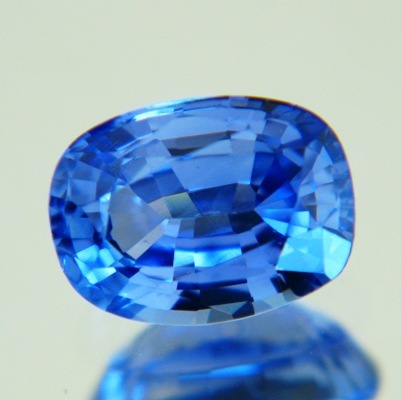 Flawless hand cut sapphire. Right in-the-color, no green, little gray, never dark, never pale, no black-outs, no window. Big enough for a gents ring. Better than the handshot which is strangely 'murky' and looks like a sky with clouds but it is a 100% sunny day. I will have to re-do sometimes. No inclusions what-so-ever. 8x6 but no window in under 2 carats. Below and under 'more images': Compare KBS218 with this one here. Clear difference between sky and kashmir blue. In between is cornflower blue.